Bird Market is in Denpasar, for 40 min. from the airport by car. Besides birds, there are many kinds of small animals such as monkeys, dogs, cats, rabbits, ducks, etc. for sale. 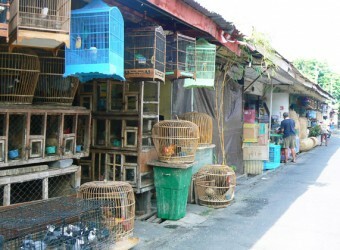 Animal lovers should visit Bird Market. You might find rare animals. As it is called Bird market, the number of birds is biggest than other animals. There is smelly because of animals, however, it is fun place to visit. It was very bad smell from the entrance gate. I was surprised when I got inside, full of birds!! Colorful birds and also bats! I wondered if there anyone buy bat?? I don’t know exactly but it was fun to see it.